The Fast Lane Sand Ripper has been on sale at Toys R Us for a number of months, but I held off on buying one until I saw it up a little closer in the store and noticed the box said, "Speeds up to 15mph" Wait, 15mph? That would make it one of the fastest toy-grade vehicles I've ever tested! While most RCs of this size (about 1/10th scale) use a 9.6V battery, this one uses a 12V rechargable pack, which is included, along with a charger for it, as well as the whopping six AA batteries the controller needs. Inspecting the vehicle a little more carefully, I realized that it looked familiar -- really familiar. 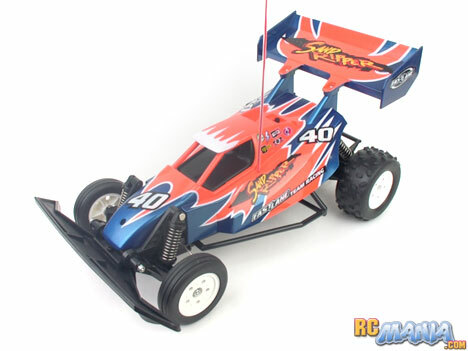 It is, in fact, an only very slightly updated version of a series of RC buggies originally made in the mid-1980s. I kid you not. Radio Shack sold an incredibly similar vehicle back then called the Golden Arrow (Google it!). The use of an archaic design is actually very exciting. The mid to late 80's are when toy-class RCs were at their best & fastest, and in general the whole market has taken a terrible dive since then. If this buggy is anything like the best toy RCs of yesterday, it would again be one of best today. A couple more notes about the Fast Lane Sand Ripper's design. The tires are real rubber, semi-penunatic, and soft. Since in the 80's toy- and hobby-grade RCs were still very closely related, it's actually possible to remove the tires from this buggy and replace them with older pro-class racing tires. The wheels can be changed too, and are compatible with some current re-makes of pro-class buggies from a manufacturer called Tamiya. The Sand Ripper has undependent trailing arm front suspension and a spring-suspended rear axle as well, but unfortunately all of the springs are too stiff to be really useful -- a mistake nearly every toy RC manufacturer aggrivatingly makes on nearly every product. One thing that I really appreciate is the very large front bumper, which is wide enough to completely protect the front wheels from impacts, and the bumper is soft enough to bend to absorb some of the shock of a crash rather than cracking or snapping. The first thing I wanted to test was the speed of the Sand Ripper, so I set up a carefully-measured speed trap at the end of the straightaway a professional RC street racing track. The highest speed it recorded, on a freshly-charged battery, was a hair under 11mph. That does make it one of the fastest toy-grade RCs I've ever tested, but it's nearly a third less than what's advertised on the box. When will manufacturers learn that exaggerating is lying, and lying to customers is completely unacceptable?! Moving past the unnecessary deception, like I said, this is a very fast car compared to the current competition. It's not blisteringly fast, but it's good for its size and price. Steering and throttle controls are proportional, giving a lot of finesse and allowing the driver to pick just the right speed and steering radius for a given turn. The ride is predictably bouncy due to the poorly-chosen springs, but the Sand Ripper still manages to get pretty good traction even on loose dirt thanks to its soft tires. The big wing, in addition to looking out of proportion, actually makes the car a little top-heavy. A couple of times I was able to come around a turn pretty fast and when I hit a bump, the car flipped over. Not a big deal, and nothing broke, but if you want the most performance out of the Sand Ripper, consider removing the wing (it's just held on by 2 screws). I am very glad I finally bought the Fast Lane RC Sand Ripper buggy. It's a very old design, but happens to be from the time when toy RCs were in their performance & quality prime. Its top speed puts it amongst the fastest vehicles tested at RC Mania to date, it has good traction, and it is very controllable. The inclusion of all necessary batteries and a charger makes it a great deal, especially for its size, at the current price of about $40 USD for the whole set. The main strike against the Sand Ripper, in my opinion, is actually something I did not really mention previously. The 12-volt battery pack is not only a non-standard size, but it also has a very uncommon connector. Getting set up with a second battery would require someone with do-it-yourself skills to either locate (doable, but not easy) or build a 10-cell rechargable AA pack, and then to replace all of the conectors with more common plugs. If, like most toy RC buyers, you don't mind sticking to just the battery that's included, then there's little bad to be said about the Fast Lane Sand Ripper.